The premise for this relationship comedy is familiar to anyone who has done some coupling. Jon (Michael Blaiklock) and Maggie (Madeline Walker) have just taken the step to move in together. While the boxes are still unpacking, each of them gets the dreaded “raccoon flu.” Deathly ill together, they find out things about each other that are both funny and dark. The supporting cast includes Antoine McKay, Gail Rastorfer and Scarlett Harper. In the following Podtalk, co-directors J. Wilder Konschak (speaking first) and Stirling McLaughlin talk about the inspiration behind the film’s situation, and the variable factors of micro-budget filmmaking. 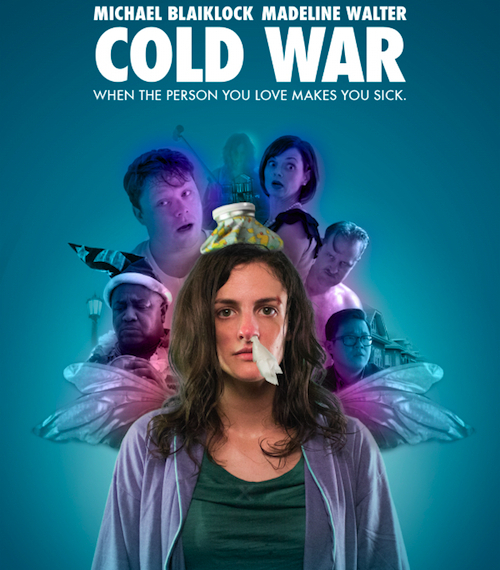 For complete digital download information for “Cold War,” click here. Featuring Michael Blaiklock, Madeline Walker, Antoine McKay, Gail Rastorfer and Scarlett Harper. Written by J. Wilder Konschak. Directed by J. Wilder Konschak and Stirling McLaughlin. Not Rated.